Brent Scowcroft (born March 19, 1925, in Ogden, Utah) was the United States National Security Adviser under Presidents Gerald Ford and George H. W. Bush and a Lieutenant General in the United States Air Force. He also served as Military Assistant to President Richard Nixon and as Deputy Assistant to the President for National Security Affairs in the Nixon and Ford administrations. He also served as Chairman of the President's Foreign Intelligence Advisory Board under President George W. Bush from 2001 to 2005. He is a member of The Church of Jesus Christ of Latter-day Saints, sometimes casually called the Mormon Church or LDS Church. Prior to joining the Bush administration, Scowcroft was Vice Chairman of Kissinger and Associates, Inc. He is the founder and president of The Forum for International Policy, a think tank. 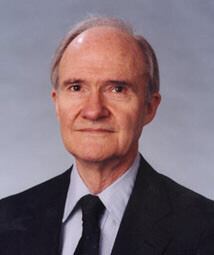 Scowcroft is also president of The Scowcroft Group, Inc., an international business consulting firm. He is a member of the Council on Foreign Relations. In the course of his military career, Scowcroft held positions in the Organization of the Joint Chiefs of Staff, Headquarters of the United States Air Force, and the Office of the Assistant Secretary of Defense for International Security Affairs. Other assignments included faculty positions at the United States Air Force Academy and the United States Military Academy at West Point, and Assistant Air Attaché in the American Embassy in Belgrade, Yugoslavia. Scowcroft retired with the rank of Lieutenant General in the U.S. Air Force. Scowcroft has chaired or served on a number of policy advisory councils, including the President's General Advisory Committee on Arms Control, the President's Commission on Strategic Forces, the President's Blue Ribbon Commission on Defense Management, the Defense Policy Board, and the President's Special Review Board (Tower Commission) investigating the Iran-Contra affair. Scowcroft was a leading Republican critic of U.S. policy towards Iraq before and after the 2003 invasion of Iraq, which war critics in particular have seen as significant given Scowcroft's close ties to former President George H.W. Bush. Scowcroft supported the invasion of Afghanistan as a “direct response” to terrorism. Scowcroft had an aeronautical rating as a pilot and has numerous military decorations and awards. In addition, President Bush presented him with the Presidential Medal of Freedom in 1991. In 1993, he was presented with the insignia of an Honorary Order of the KBE by Her Majesty Elizabeth II of the United Kingdom at Buckingham Palace. He received his undergraduate degree and commission into the Army Air Forces from the United States Military Academy at West Point. He has an M.A. and Ph.D. from Columbia University. He co-wrote A World Transformed with George H.W. Bush. This book described what it was like to be in the White House during the end of the Cold War, as the Soviet Union collapsed in the early 1990s. He was interviewed for an episode of Da Ali G Show which aired in 2003. Bartholomew Sparrow penned a 2015 biography of Scowcroft entitled The Strategist: Brent Scowcroft and the Call of National Security. Sparrow called him “the United States’ leading foreign policy strategist of the last 40 years.” Inside the world of foreign policy strategists, one of Ronald Reagan’s and one of Barack Obama’s national security advisers said Scowcroft was their model. Although some of his decisions were controversial, Scowcroft called his approach “gardening,” designed to patiently foster long-term change, a temperament that Sparrow explored in his book. This page was last edited on 29 July 2015, at 00:36.